1. 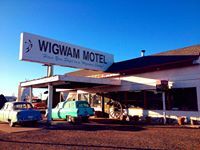 Wigwam Motel–I must ask you all a question? 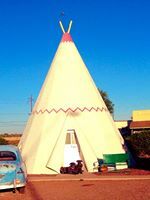 Have you slept in a Wigwam lately? What can I say, you see the pics. It is TOTALLY worth it. 2. 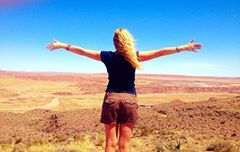 Painted Desert and petrified forest – this world, it baffles me. The people in it, even more. Our national parks, our national landmarks–filled with foreigners! Learning the wonder of the history of the world through the breathtaking geography of the United States. Interpreting the captions for their children, hiking in the American Sun, and soaking in all that a $10 annual pass can give. Where were the American families? What do we learn from Disneyland? I hope it’s not too weird to say, but I’ve decided to swim in this real world until I’m all pruny. I want my kids to feel this. 3. 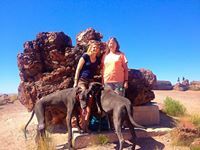 Freak hail storm in New Mexico added drama to an already wonderful day where I got to hug my longtime long distance friend Ariana Strong. 4. Not to get all mushy, but we changed our route to crash in Amarillo in a Days inn that, in a former life might have been a urinal. I can’t miss the opportunity to graffiti at the Cadillac Ranch. With my MOM!! 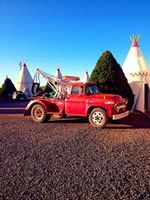 This entry was posted in Just Being Me, Travel, Weird America and tagged Cross Country Drive, memorials, Petrified Forest, Route 66, Travel, Wigwam Motel. Bookmark the permalink.